Here's my brief profile/resume. Please Contact for my detailed CV. Education is what remains after one has forgotten what one has learned in school. / Albert Einstein.
" Mr. Bayildiran has become an excellent team player and has shown initiative, enthusiasm and diligence in performing his duties. " " I highly recommend him because, beyond his professional competence, he is the sort of individual who brightens up an organization just by his presence, something that cannot be taught, only appreciated.. "
" ...his interpersonal and communication skills have allowed him to develop productive working relationships... "
" ...Mr. Bayildiran has carried out the correspondence, liaison and translation work of East-West Motorway Project/Algeria... "
Since a plain resume can't capture all the colors of my experience, here's the Visual Portfolio of my past. Please click thumbnails to get more information , use upright button to expand the image . ��pler Site is an open-pit mine located 120km southwest of Erzincan City in the eastern part of Turkiye. The estimated cost of the project is $250m. 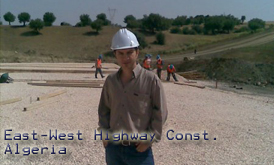 The world�s largest ongoing highway construction project, $11,2b. Financed by the Algerian Government. Managing body of the Project is a japanese consortium, COJAAL (Kajima, Taisei, Hazama, Nishimatsu, Itochu). The first international experience gained by me, in this enormous project! Tercumen is a local interpretation agency. Founded in 2005.
along with consecutive interpretation & guidance service in business meetings and corporation dinners, Sworn, Notarized, Legal & Private Document translations, etc. are also supplied. Contact - It's time to hire me!